Bouteflika’s critics were initially cheered when he decided last week against running for re-election after 20 years in power. Unfortunately, he decided nobody else was running, either, and canceled the April election. He has resisted calls for his resignation and constant street demonstrations have occurred ever since. On Monday the reclusive octogenarian president issued a statement that he will not resign or allow new elections until a new Algerian constitution is approved, a process that is expected to take the remainder of 2019 to complete. Friday saw hundreds of thousands of people in the streets of Algiers for the largest demonstrations to date. Organizations ranging from medical collectives to Islamic clerics have begun advocating acts of disobedience toward Bouteflika’s illegitimate government. “We wanted elections without Bouteflika. 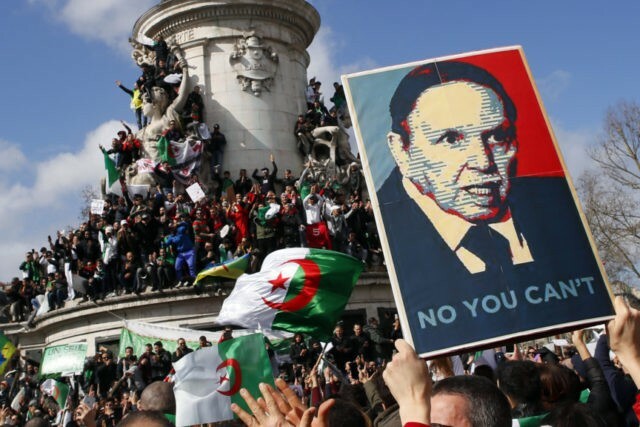 We were given Bouteflika without elections,” reads one of the pithier signs hoisted by the protesters. The ranks of young student protesters have swelled with professors and medical professionals, giving birth to a multi-party political movement called the National Coordination for Change (NCC). The NCC’s inaugural statement on Tuesday called on the government to resign and asked the military to remain impartial. Algerian army officers last week hinted at resolving the political crisis. AFP on Tuesday judged the tide began to turn against Bouteflika when the ailing president went to Switzerland for medical treatment, prompting some of his political allies to desert. Bouteflika’s last-ditch effort to defuse tensions by appointing a new prime minister does not appear to have satisfied any significant number of his critics, although the new deputy prime minister, Ramtane Lamamra, on Tuesday launched an international expedition to rally support for Bouteflika from important Algerian allies and investors such as Russia, China, and the European Union. Lamamra held a joint news conference with Russian Foreign Minister Sergey Lavrov on Monday at which he gave assurances Bouteflika will relinquish power to the next elected president. By all indications, the protesters will not be mollified until that election is scheduled, and they will want it held in the very near future. Bouteflika rarely appears in public, communicating primarily through spokespeople and statements read by the media. He was not even healthy enough to personally submit his paperwork when he originally decided to run for another term, which technically disqualified him from the election under Algerian law. He doesn’t have the legal authority to cancel the election, either, so the originally scheduled date might become a flashpoint for more unrest. The BBC suggested the countervailing apprehension in Algeria is that no one is quite certain what will happen if Bouteflika resigns or is removed from power. His administration was so confident nobody wants to find out that it seemed genuinely surprised by the size and persistence of the protest movement. The restrained behavior of the protesters thwarted attempts to dismiss them as thoughtless agents of chaos, and they do not appear to be directed by any single partisan organization.